The Borden Park pool is plagued by its own popularity. The Borden Park natural pool has been plagued by its own popularity. Only 980 swimmers are allowed in the pool per day to ease the pressure on the natural filtration system, a bricolage of sand and granite filters aided by aquatic plants, such as reed grass and pond lilies. At any given time, there can't be more than 500 people inside the complex. Staff have closed the pool early four times in six days since opening, on account of the daily limit. The pool reached the mark by 3:00 p.m. on Thursday and Sunday, a full five hours before it's scheduled to close. "Since we are a natural swimming pool, our facility and our filtration system - since it's still in its infancy - can only handle so many individuals," said Cindy Schlosser, facility manager at the pool. "The plants are still growing and developing." On Tuesday, the hottest day of the summer thus far, roughly a thousand people lined up in hopes of taking a dip in Canada's first natural swimming pool. The temperature was almost 31 C when Courtney Kennett and her son arrived just before the pool opened at noon. "Instantly, I was like, 'oh, maybe we should just find one of the other public pools'," Kennett said. "It looks like it's a beautiful facility, but if the wait is this long, maybe we'll wait a couple seasons before the hype of it wears down," she added. Debbi Conn learned about the pool's popularity through experience. 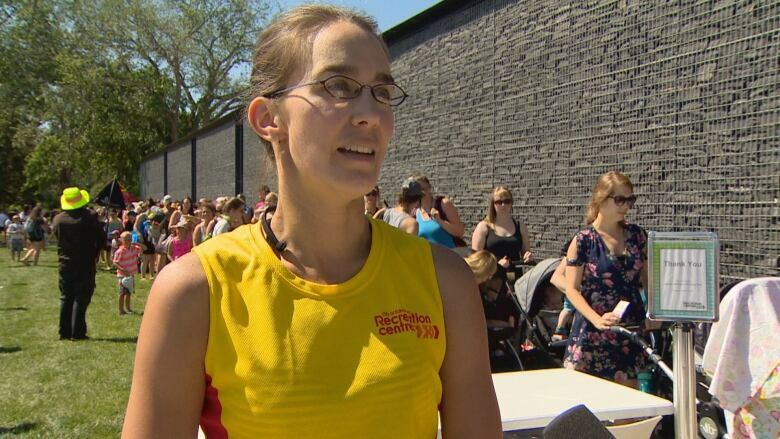 She abandoned her afternoon pool plans last week when she wasn't among the first 500 to get inside, despite arriving at Borden Park by noon. On Tuesday, Conn and her daughter were lounging in lawn chairs and in the shade of umbrellas at the front of the line by 10 a.m.
A serpentine stretch of people wrapped around two walls behind her and down an adjacent walking path. "If you get here after it opens at noon, you'll take about an hour to get just around the corner," she said. "Your hopes and dreams will be dashed though when the pool staff come out and tell you they're filled to capacity." 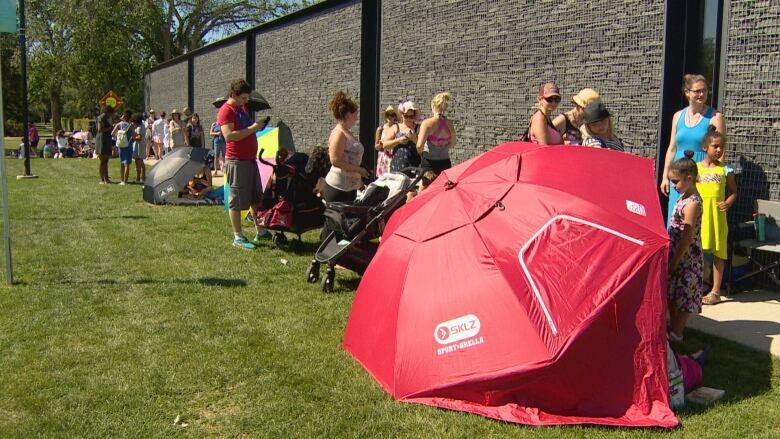 While some people waited in line in hopes of wading through the $14.4 million pool, others were not enticed enough to wait beneath the scorching summer sun. Maryan Khalif and her two kids were hoping to show off Edmonton's newest outdoor pool to friends visiting from Ohio. The group waited for about 30 minutes before retreating back to an air-conditioned car and making plans to visit a nearby splash park. "I mean I'm a little bit disappointed, but we'll come back another day. Perhaps in a couple of weeks it'll die down and we can enjoy a swim day," she said. Khalif said she's been eager to try the pool since it opened last week after numerous delays. The pool was originally slated to open in the summer of 2016, but the project was first delayed because of a major redesign to lower costs and was further delayed last month due to a leak in the filtration system. For Khalif, and others disenchanted by the long lines, the wait continues.